Have you considered the possibility that you’ve simply completely misdiagnosed the problem? The problem isn’t that cyclists, pedestrians and motorists are treating each other with too little respect. It’s surely that motor vehicles kill lots of other road users and motorists don’t realise that’s mostly motorists’ fault. Under those circumstances, “addressing all road users” is an insult. It’s like addressing rapists and their victims as equal parties. All the research I’ve seen says the majority of cyclist/motorist crashes are the motorist’s fault. I’m not so sure on pedestrians but I’d bet that motor vehicle speed and inattention are the main issues there too. You’re legitimising motorist misbehaviour by addressing the victims as if they were also perpetrators. That’s pretty much it. This comment on Twitter from Michael Macleod expressed much the same point, but more succinctly. People walking and cycling about are not killing or injuring motorists in great numbers. By contrast, motor vehicles are killing and seriously injuring pedestrians and cyclists in large numbers, and in the majority of cases, it is the motorist’s fault. In the light of these facts, it seems completely bizarre to focus on asking all parties to behave nicely, instead of focusing on a root cause of the problem – poor behaviour from motorists, ranging from inattention, right up to dangerous driving. (This is to say nothing of how the Nice Way Code is being funded from the Sustainable Transport budget, instead of from funding that might impinge upon motoring). Our research showed that an even-handed approach would be the most effective way to reach to all road users, rather than singling out any one group. Drivers are obviously a hugely important part of this, but all of our testing showed if you single them out, they will not listen. We need them to listen, so we’re speaking to all road users. We ‘re not saying all behaviours are equal – we’re just saying everyone can play a part in making the roads a safer place. The claim here is that a road safety campaign that targets drivers – and drivers alone – would be ineffective, because drivers ‘will not listen’. In order to get drivers to pay attention, the Nice Way Code therefore has to simultaneously present messages to pedestrians and bicycle users (like ‘tolerate HGVs’ and ‘don’t cycle on the pavement’). That’s why the Nice Way Code is so ‘even-handed’, asking everyone to play their part in making the roads a safer place – because apparently drivers won’t respond to a campaign that doesn’t ask pedestrians and cyclists to play nicely too. It seems the Nice Way Code don’t think drivers can be asked to behave without messages about cyclists riding on the pavement being tacked on too. I find this quite odd – safety campaigns are frequently aimed solely at drivers (for instance on drink driving) – and said so in a comment that remains in moderation long after many others have been approved. 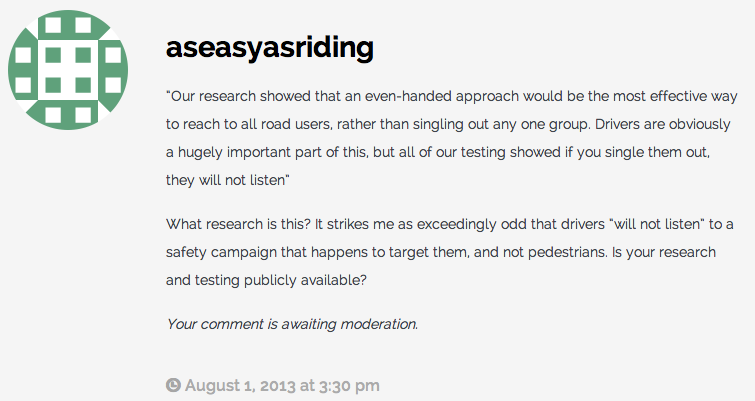 So my question about the testing that has informed the Nice Way Code that drivers ‘will not listen’ to a safety campaign that happens to target them, and not pedestrians, remains unanswered. Gary Dawes subsequently asked if the research was going to be published, but didn’t receive an answer either. Given that this campaign is costing £424,000 of public money, it would be ‘nice’ to see the research which has justified its approach. Where is it? More to the point, as any decent Health and Safety practitioner will tell you, you can’t solve problems like this through user education. Drivers, on the whole, are already “nice” but we all suffer from momentary lapses of attention for all sorts of reasons. Driving a motor vehicle is a highly complicated task (ask any learner!) and we can only do it by making most of the work sub-conscious, and by focussing consciously only on the most important things that might affect our safety. So drivers will concentrate on large lorries that are close to them, and police cars, but will mostly ignore pedestrians and cyclists as being uninteresting sensory “noise”. The only sensible and effective solution is the Dutch method of “sustainable safety”. This makes it difficult for people to hurt each other by accident, and accepts that humans are very fallible. The same concept applies to railway safety: it is assumed that human drivers and signalmen will make mistakes, so systems are built that prevent mistakes (signal and points interlocking, automatic braking if signals are passed at danger, etc.). Event the tracks of a railway give sustainable safety, but removing the need for a human to steer the vehicle: this allows trains to travel more than twice as fast as road vehicles with a much better safety record. Even the tracks of a railway give sustainable safety, by removing the need for a human to steer the vehicle: this allows trains to travel more than twice as fast as road vehicles with a much better safety record. It all reminds me of this scene from Tim Burton’s Mars Attacks! in which Jack Nicholson asks the psychopathic aliens why they can’t “just get along.” Of course, it ends badly for him. I listened recently on radio4 to a report on ‘research’ by an academic who reckoned from his research that richer people were more likely to disregard the law, including motoring law, than poorer people. Better off drivers broke the motoring law and drove more aggressively than less well off ones. Any cyclist will know that there isn’t a complete correlation here – we’ve all had to deal with ‘rusty white van man’ as well as ‘get out of my way jaguars’ – but the research is interesting and relevant to us as cyclists (the academic suggested that being well off gave people a sense of entitlement to roadspace etc). Another piece of new is also of interest to those of us campaigning for a change in urban transport policy. It has been known for a while now that motoring mileage is falling and that younger people drive less than their similar age cohort did 10 or 20 years ago. The other news is that there is a shift in trends in the car market from less expensive cars to fewer but more expensive ones. There is a belief promoted by politicians and press that we can restore the national standard of living ‘enjoyed’ in this country before the financial crisis. I don’t think this is likely* and I assume that income inequality is likely to grow as the reduction in GDP is unevenly spread, so these trends in motor usage are likely to continue into the near future. In other words, while traffic levels are falling, the remaining drivers (who will benefit from reduced congestion) will be increasingly the better off ones – and thus those more likely to feel that they are entitled to the road (especially as they have to pay so much tax). Thus, fewer cars and fewer motoring miles may well not lead to improvements for cyclists in driver behaviour (with reduced congestion leading to higher attained speeds in urban areas). The countervailing factor will be that there will be a large part of the population for whom owning a car will become too much of a financial burden and the size of the lobby for a change of policy will potentially grow. *I share the analysis that says that because a significant part of UK standard of living depended on debt (and here I mean private debt, not ‘government borrowing’) and that debt depended on imbalances in the global financial system, imbalances that are now being eliminated, it means that the same level of international credit will no longer be available. You mention that it can be as simple as inattention. In a recent news story a man apparently had a coughing fit and accelerated instead of braked while driving past a school. http://www.bbc.co.uk/news/uk-wales-22985019 Thankfully no deaths but some nasty injuries. Accidents happen and it’s hard to blame someone for a coughing fit. But you can ensure fast busy motor traffic isn’t right next to those of us who aren’t safely locked in metal boxes, like cyclists and schoolchildren. I’ve just had a very nice lady come to my door from Cambridgeshire County Council asking me to bend her ear on transportation. She offered me some maps and bus timetables. I mentioned to her the NiceWay code. There’s no “nice way” to cross the A10 to get out of Ely, that’s for sure. CCC spend their sustainable transport budget on compiling more stuff we already know and offer us more maps that may tell us where to go if we don’t want to get killed. As usual the paltry amount of money spent on being sustainable only ends up going on information and research, the outcome of which is always asking them to make the place more liveable for those not in cars and they nod, shrug and say ” yeah, we know, we will see what we can do” this translates into we can plead to central gov but unless it involves something we can say will put money back into the exchequer (like a business park), the cheque book is closed. Fail. F*ck me how the f*ck to you manage to spend half a million quid on the this cr@p? What a f*cking waste of money. Money which could’ve built actual safe infrastructure. Is there anybody who knows how long it’s gonna take England/Scotland to get a dutch level of segregation with the currently funding and projects? That should make NIceway’s work easier: they know for how long they will have to change the behaviour of the motorist. I’m trying to decide what is worse. The fact that someone authorised the use of eye watering amounts of scarce public funds on this victim blaming campaign, or that some self flagellating halfwit at the CTC decided to support their own victimisation. If you are a member, tell the CTC why you will be leaving their collaborationist outfit. I intend to do exactly that. This ‘NiceWay’ nonsense is the last straw for me, considering the CTC deign to call themselves the ‘national cyclists’ organisation’. Disgraceful to support this victim blaming campaign. I am writing to inform you that I have reluctantly decided to allow my family membership of the CTC to lapse from next year by cancelling my direct debit subscription. The primary reason for my decision is due to my dismay at the CTC’s endorsement of the Scottish government’s ‘Nice Way Code’ campaign. I won’t waste your time explaining in detail why I think this campaign is divisive, misguided and a waste of tax-payers’ money. Instead I would point you to the several relevant posts on the ‘aseasyasridingabike.wordpress.com’ blog. I agree wholeheartedly with the author’s criticism of this misguided campaign. I would also point out my agreement with comments made by ‘fonant’, Dr. Peter Matthews and Ian Bradbury on the Nice Way Code website here: http://nicewaycode.com/2013/07/30/research-an-informed-approach-to-the-campaign/#comments. I have become somewhat disillusioned with the CTC’s stance over the last year or so; for example the continued endorsement of the wholly discredited (in my opinion) ‘Hierarchy of provison’, the woefully poor examples of what is endorsed as ‘best practise’ in the CTC benchmarking archive and the continued promotion of ‘softer’ or ‘smarter choice’ options (including promotion and marketing) as being equally important as road layout and conditions in increasing cycling. All the evidence I see on the web and with my own eyes convinces me that the latter claim is totally untrue. When CTC endorses the waste of scarce tax revenue on a disingenuous marketing campaign such as the ‘Nice Way Code’, that is the last straw for me and my family. I use the word ‘disingenuous’ advisedly; everything I read on the Nice Way website convinces me that the only intention of this campaign is to maintain the status quo on Scotland’s roads and avoid making the tough decisions that really need to be taken to increase everyday cycling there. I do not want to see a similar campaign in England or Wales for the same reasons. I respect CTC as an organisation to support touring cyclists, for whom you do a tremendous job. I also respect your work towards improving access for off-road cyclists. 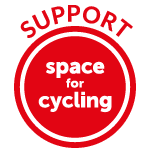 However, the CTC now calls itself ‘the national cycling charity’ with a stated aim of making the UK ‘a place where it’s easy and safe for people of all ages to cycle, whatever their ability, background or income’. In order to do this I believe CTC needs to distance itself from the Nice Way Code campaign, which history indicates will fail to encourage people to cycle and may even marginalise cyclists still further. I do sincerely hope you will reconsider CTC’s official stance on this matter. I’ve given myself an option to re-join if CTC recant, since I think the membership is generally worthwhile. However, if they continue to endorse the ‘Nice Way’ campaign I will not do so. I’ve put a ministerial correspondence in to ask what research they used and if a cost-benefit-analysis or similar was carried out. Better off drivers broke the motoring law and drove more aggressively than less well off ones. After a large number of press releases about their launch, the publicly-funded Nice Way Code people have issued what seems to be their first product – instructions to cyclists (regarding ‘overtaking’). I accept that cycling standards in Britain are inadequate, but that is best corrected by stimulating cycling levels and establishing a cycling culture. I’m surprised that their ‘research’, which they claim told them that people don’t like being lectured to, wasn’t applied to assessing whether to issue this little lecture was worth the effort of compiling and publishing. More critcally, I’m afraid that the message is dreadful. The advice puts ‘Understanding Advanced Road Positioning’ at the top of its ‘guidance’. What then is the detail under this rubric? Well it tells us that, “as with a motor vehicle, there are many factors to take into account before overtaking”. Yes, good, but such as? Well only two bits of advice: 1 – “waiting for traffic to move in the primary position (the centre of the active traffic lane) may be the safest course” and 2 – “the use of cycle lanes is optional and in many circumstances, riders will be safer riding as part of the traffic”. No. 1 is unfortunately a bit ambiguous – does it mean ‘wait in the primary position, for traffic to move’ or ‘wait for traffic in the primary position to move’? The way it is written it could be either, but I guess it means no. 1, though no.2 represents the reality of road cycling. In either case it offers no real guidance about how and when to move into the totemic ‘primary position’. Even if the wording wasn’t ambiguous, the message is not going to get through to anyone who doesn’t already know about ‘primary position’ and all that guff. But my main objection is that the only messages they offer are ideological, coming from the old school of thought that all you need to do is ‘train’ cyclists to cope with cycling in ‘traffic’. The comment about cycle lanes is curiously one-sided as it too represents a particular set of ideas. The public money that is desperately needed to be spent on developing cycle networks is being wasted on this sort of well-meaning but ineffectual nonsense. I recall a few years ago a TfL/Mori research report that claimed that very few London cyclists used cycle lanes. Cyclists, said the research, considered that such lanes were purely ‘totemic’. When I asked TfL and Mori for details of their research it turned out that it consisted of ‘focus groups’. They conceded that none of the cyclists had used the term ‘totemic’ and that it had been suggested to the cyclists by the focus group organiser. I suggest that the Nice Way Code is the real totem pole.